Sleipnir Fieldstone is from Rhinestone’s final foal crop; and he is out of one of my favorite mares, Emma, who we have on a breeding lease. 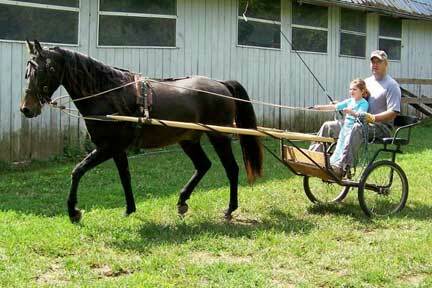 Fieldstone is trained for harness and saddle. He is one of two well trained mature geldings that we have for sale. The other is Sleipnir Celestial Array. We also have several mature geldings on our sales list for other owners. Fieldstone has been handled by both professionals and amateurs since his birth. All our foals are imprinted at birth…more on that topic later. He was started in his ground driving training by a very experienced long-time carriage driving enthusiast, whose family has had morgan horses for generations. 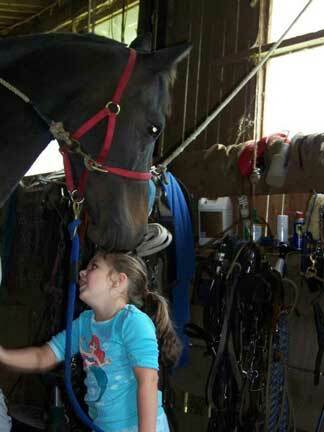 Fieldstone recently has been in professional driving training to be completely finished as a safe family driving horse. He has been shown in Morgan Class A pleasure driving, but that is an aside from his family driving. Mary Kate driving S. Fieldstone. Photo by Audra Olinger.In his picture here, he is being driven by our trainer’s 4 y/o daughter. She has the reins. Travis Olinger, his trainer, showed him at the 2011 Liberty Classic Horse Show. Travis’ email is: atolinger@charter.net He trains harness horses. 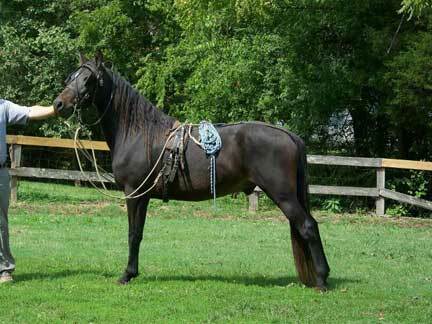 His family is prominent in Hackney pony and Saddlebreds in Harness here in Eastern Tennessee. He likes to work with amateur owners. We are encouraging an appreciation for our family friendly morgan show and backyard horses. S. Fieldstone was recently shown in Pleasure Driving at the 2011 Liberty Classic Horse Show. I will post pictures, etc from that in another blog posting. After his class, Fieldstone also was driven on the show-grounds by an amateur beginner new to him. He has been trained to saddle by our middle grand-daughter, Kimberly, when she was a younger teen-ager…beginner. He has been ridden in rings of various sizes and in our fields. She has severe allergies so she has not been up on him for awhile. But his driving is totally up to date. Fieldstone loves humans, especially the little ones. We have used him as a grooming demonstration horse as a 2 y/o, with THREE 7 – 8 y/o boys…and a surrounding crowd. He also has gone as a breed representative to a Farm Extension Day for all the county first graders, and extended families, and home schoolers. This entry was posted in American Driving Society, Bay Gelding, Coat colors, Delano Tennessee U. S. A., Driving Horses, Family Horses, Geldings, Horse Shows, Liberty United Classic Horse Show, Morgan Horse, morgan horse farm, Morgan Horse versatility, Prefix, Sleipnir, Training your horse to drive. Bookmark the permalink.